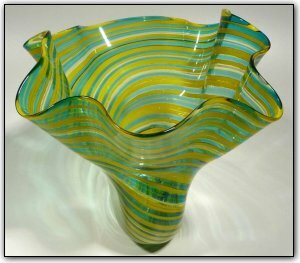 This vase features a unique combination of a transparent blue and an opaque yellow, creating a stunning vase that almost has the characteristics of green due to the reflections and transparent-opaque combination. Working with canes is a time consuming two-stage process. First Dirwood hand pulled the canes used to make this vase, and then he made the vase using those canes.